The end is near. They couldn't even find a ripe quince for the "recipes for everything in season" September issue. I’ve meant to blog about Gourmet magazine’s fate but can’t seem to manage posting more than once a week these days. Folks have a special fondness for it here in this food-loving state. And Gourmet loved Oregon back: see this recent feature on Portland Food Carts. But I came late to the Gourmet table. I didn’t have the same heart attack/heartbreak other foodies did when the news of its demise broke. Yet it’s trumped-up website, rolled out by the magnetic (and tireless-that woman is always on the road) editor Ruth Reichl, drew me in this past year. Particularly Politics of the Plate columns. And their cookbook club reviews of new ones like Corey Schreiber’s Rustic Fruit Desserts. That’s where I got the apple-blackberry pie recipe. The website even encouraged me to subscribe for $12 a year. Wonder if I’ll ever get that first issue? But I can barely keep up with Bon Appetit. Two increasingly identical food pubs under one house is redundant, especially in these times. Why not keep the website though? The September cover does now seem a harbinger of Gourmet’s imminent demise. 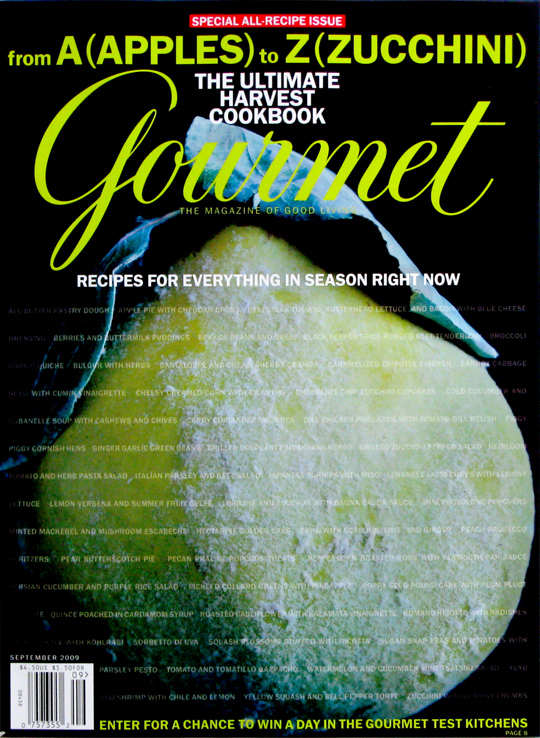 Why would they put an unripe (green, still fuzz-covered) quince on the cover of an issue devoted to cooking with produce at its peak. Quinces don’t really come on ’til October. At least they got the favored quince preparation method right: poaching, in cardamom syrup, which really brings out the Caucus region fruit’s rosy fragrance and flavor. These Oregon quinces are ripe. You can see-and especially smell-the difference. Laura – I was a subscriber to Gourmet for 26 years! I am really sorry to learn of its dmise. What do you think they’ll do with us subscribers? Give us an extra subscription to Bon Appetit?! I think that Gourmet lost it’s way for awhile after Ruth took over; they seemed to be getting back to a good place in the past year or two. I liked their weekday night recipes and many of the articles. Wow, Judy. You must be in mourning. Yeah I guess you’ll get BA or a refund. Thank you very much for this article, the most comprehensive I have found so far. My Portuguese grandmother used to serve slices of home-made quince marmalade and Muenster cheese with coffee and buttered toast when we came to visit. Years ago, I bought a few in a high-end market near Marymount Manhattan College and got weak in the knees at the fragrance. I have read that it was customary to put the fruit in linen closets and drawers. I had been unable to find the whole fruits and recently purchased some marmalade through the mail from both Zingerman’s and La Tienda. Whenever I eat it, it is as if I am honoring my grandmother. Thanks for the kind comment, Marie. Have you tried Whole Foods? They should have ones from California through New Years. I heard this New York farm also grows quince: http://www.brownsberrypatch.com/. I think some of the NYC farmers’ markets should have them, too. The fragrance of quince really is incredible.